Coop's last day of kindergarten. You expect to be emotional when dropping them off on their first day of kindergarten but the emotions you feel on their last day is unexpected! lol Congrats to my baby boy, Coops! He is growing up! 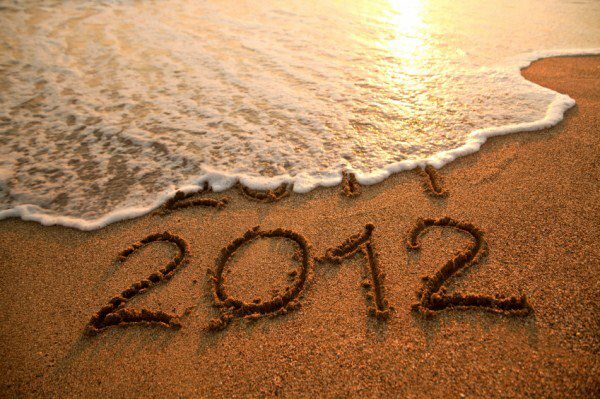 It's 2012! Happy New Year! I stopped by my blog today just to check out how I did on last year's resolutions. One of them was to post to this blog 2-3 times a month. Well, I did post 3 times in 2011 so I'd say that's a great big success huge FAILure! Oh, well. Resolutions were made to be broken, right? 2011 really was a great year for us. Personally, I ran 3 marathons, 2 half marathons, a 10k, 3 5ks and Ragnar. I raised money for a fantastic teacher while training for my last marathon and I qualified and joined the Marathon Maniacs. I've also made some new friends, read lots of good books and thoroughly enjoyed my first year back as a primary teacher. Our vacations were short but fun. As a family, we went to St. George, Disneyland, Park City, Lagoon for a couple days and even flew to South Carolina for Thanksgiving. As a couple, Will and I went to San Francisco and I also spent a few days with my girlfriends in Southern Utah. Will got away to Vegas with his buddy Seth for a couple days, too. Coleman and Cooper continue to grow and I continue to struggle with the internal conflict of being happy to watch them grow vs. being sad that I can't stop time and have them be my "little" ones just a bit longer. Coleman is insightful and kind. Cooper is energetic and precarious. They couldn't be more different and each year that passes proves it even more. I love being a mom. I am in love with those kids. They. Are. Everything. I will continue running throughout the year and run at least 2 marathons. (A good number since that is how many I'm signed up for already.) My foot is injured and I'm not sure how well I'll be running once I get back to it so no time goals for now. I will work on magnifying my callings at church (my current callings are primary teacher, yw asst camp director and visiting teacher). I will focus on making sure my primary kids, the young women and the ladies I visit teach know I love them through acts of service and kindness. I will apply to go back to school and start finishing what I started all those years ago. I will focus on the health of my family and be sure to feed them healthy, well thought out meals and set a good example for my boys with my own healthy habits. I will find and maintain balance in my life, remembering that, when I put my Father in Heaven first, He will help me to keep things in perspective. I kinda' feel like I should be saying amen after all that. Haha. Nothing like setting new goals to remind you what's really important. I'd say that's a good list for now. 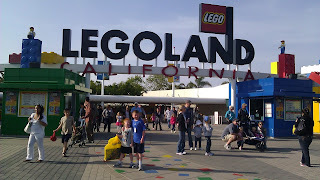 We had originally scheduled our trip to California for the first week of March but I *still* had to flu (after 2 weeks!) so we canceled our hotel reservations and decided that we would go during Spring Break, almost 6 wks later. Let me tell you, that was a LONG 6 wks! We love this yearly trip and couldn't wait for a little down time. When Spring Break finally arrived, we packed up the boys (and nearly half our belongings) and headed south! Day 1- We left Saturday morning and drove through snow (for 4 hours!) until we hit St. George. The weather was so terrible when we left home that it just made us feel all the better to leave it behind. Once we hit Cali, the sun was shining and the skies were clear. We knew we were in for a great week. 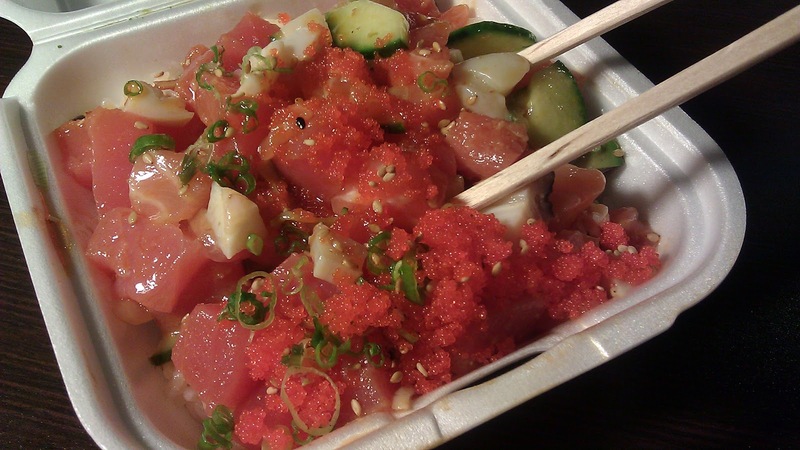 That night we settled into our hotel room and got poki bowls from our favorite sushi spot. Day 2- We had originally planned on going to the beach on Sunday but at the last minute we decided to do our first day at Disneyland instead. We figured it may be better to have a rest day on Tuesday, in the midst of all the theme park madness. This ended up being a really good decision. 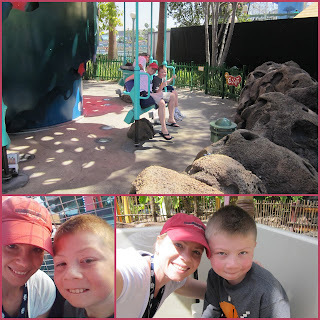 As soon as our shuttle arrived at Disney, we went right to guest services to pick up what I like to call our Autism Fastpass. This little card is like GOLD! We get on every ride with no wait. Such a beautiful thing. I used to feel a little guilty using it but now I just see it as the universe's way of paying us back for all the struggles. Having a child with autism doesn't come with many perks so we really relish this one. Will and I joked with each other that some people would pay any amount of money for a card like this. You wouldn't believe how much you can see and do in one day when you don't have to wait in lines. Anyway, I digress. Where was I? Oh yeah, so we got our pass and started the boys out slowly on the kiddie rides. The boys took turns picking rides and we rode everything we wanted to ride in Fantasyland by lunch so we headed to Tomorrowland. We made it to the Jedi Academy show a few minutes early and made some signs while we waited. They were the first ones picked! Cooper takes the Jedi training very seriously and even stood solemnly with his hands clasped behind his back as the Jedis made there way out to the stage. It was his way of showing reverence and respect for them. All the other kids were jumping up and down yelling but not Cooper. He's a true Padawan. Haha! That kid cracks me up. Coleman couldn't have cared less about it all. This pic kinda shows that. Cooper is all ready to fight and Coleman? He is staring at his feet, off in a Fantasyland off his own, I'm sure. A little bit later, we headed to Downtown Disney to look around and when we stopped to get the boys some cotton candy, Coleman, without warning, threw up right in front of the cart. No "I-think-I-need-to-hurl" look on his face. Not even a preemptive dry heave to warn us. It must have surprised him as much as it did us because he just stood there. I quickly pushed him over to the bushes behind the cotton candy cart to finish up. Poor guy. 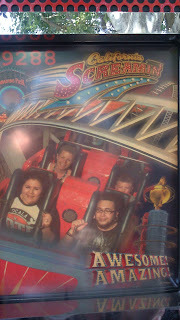 Throwing up at Disneyland. :( But not 5 minutes later, he said, "I feel way better!" and we continued on with our day. He is such a trooper. Day 3- Disney's California Adventure- More rides. Coleman and I rode a lot of the rides together that Will didn't want to ride (namely the ferris wheel and, well, anything else that goes in a circle.) Cooper was still a little gun shy about most the rides in DCA. We didn't split up too often, though. We rode the Toy Story ride together. And the Bug's Land rides. And we explored together at the Redwood Creek Challenge Trail. 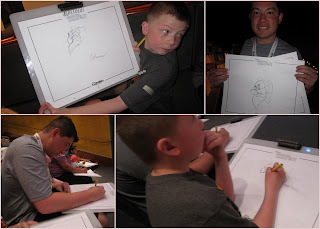 Plus, we all happily learned how to draw Grumpy at the Animation Academy. Well, most of us. One of us was "grumpy" about not being able to keep up. Poor Cooper. He was so sad. Looks good to me, though! and a quick pic in front of the Tron lights. Day 4- Rest Day!- Will and I love the rest days because we basically just roam around looking for unique places to eat. The boys went swimming that morning for a couple of hours at the hotel pool. (A side note: Cooper really swam! He was swimming underwater just like a little fish.) After swimming, we went to Trader Joe's and picked up some fun food- yuca chips, cocoa nibs, sprouted wheat bagels, peanut butter cream cheese. I love this store. So much cool stuff! After Trader Joe's we went to H&M and I bought some super stylish jeans for little Coops. 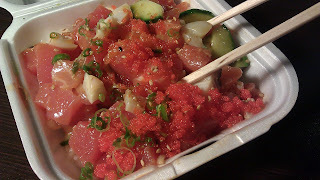 Then, we drove to Newport Beach and ate an amazing seafood joint, Bear Flag Fish Co. So good! Then it was over to the pier to see the ocean and put our feet in the water. Although, the boys couldn't help but go in a little deeper. They weren't in swim trunks and we had no towels with us but how could I tell them to not go in. It's the ocean! After a little frolicking, we grabbed a couple doughnuts from a boardwalk bakery and bought some smoked salmon from another seafood place and headed back to the hotel. Another full day of active resting. Loving vacation! We had never gone to Legoland in the past but Cooper is such a Star Wars Lego superfan that we decided to give it a go this year. We had heard that it was great for smaller kiddos so we knew the boys would like it. 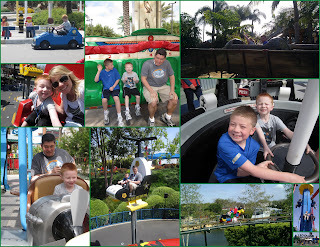 All the rides were low on the intensity scale, which Cooper really liked. The lines were short and the park is clean and well-maintained. Cooper also got his Star Wars Lego fix. Coleman rode a semi-fast but still very small coaster here and was really warming up to the idea of riding some of the bigger coasters at Disney. Day 6- Our last day in California. :( We spent the day going back and forth between Disneyland and California Adventure, riding everything that we missed the first couple of days. Coleman had finally built the nerve to ride the big coasters so he and Will started the day by riding Space Mountain. Then Coleman and I tried out the Matterhorn. I totally forgot my camera in the rush to catch the shuttle that morning so I only got a couple pics with my camera phone. Here's a pic of a pic of Coleman and I on California Screamin'. That was a big deal. I was so impressed that he rode it. He was really scared while we were in line but afterward, it was all he could talk about and he even rode it again with Will. We were very proud of him for overcoming his fear. The day seemed to go by so quickly and before we knew it we were watching the World of Color show and enjoying our final moments at the park. Day 7- After sleeping in, we got all packed up and headed home. We were so sad to leave, as always. What a blessing this last week was to us. So many fun memories were made. I loved being able to spend all this time together. I can't wait until the next trip we take together. Coleman over the years. He's so grown up! 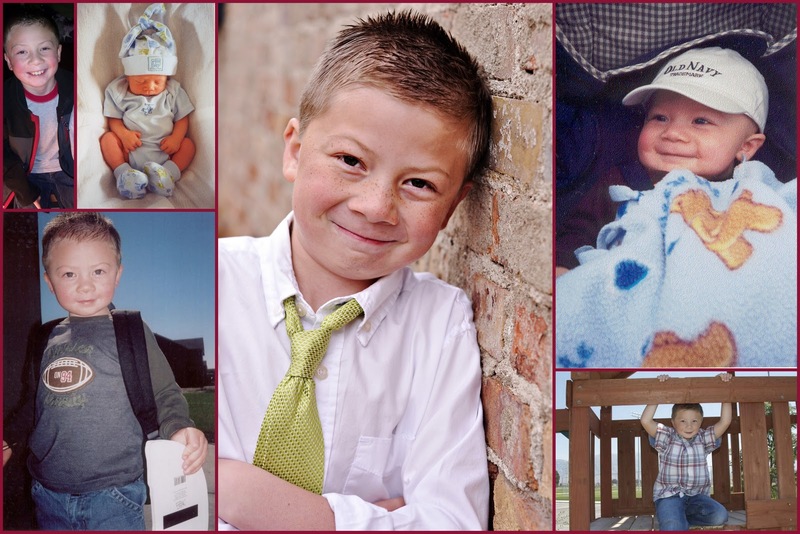 My firstborn babe turns 9 today and I'm finding myself oddly emotional over it all. Where has the time gone?! My sweet little baby is now my sweet not-so-little kiddo. I keep asking him to stop growing but he says he can't help it. :( So, I guess all I can do is learn to appreciate right now. With that in mind, here are my top 10 favorite things about Coleman. Coleman cares SO much about doing what's right. He is determined to be the type of boy that his Heavenly Father wants him to be. He is always reminding us to pray and read our scriptures and is such a good example to us all. Coleman will do anything for his little brother. From the time Cooper was a baby Coleman has shared everything with him. We remind Cooper often how lucky he is to have such a loving big brother. Coleman is really creative and loves to write. He is constantly brewing up new ideas for scripts for movies, shows, etc. And he is a very smart, witty writer. He loves when his stories make me laugh. And they do. Often. Coleman has an amazing mind. I would just love to step inside his brain for just a moment to see how it all works. He never forgets anything! And some subjects (ie. tv and movie ratings) he knows all the way down to the tiniest detail. It's fascinating. This boy will eat ANYTHING. There is nothing that he won't try. He loves sushi, smoked salmon, and his grandmother's HOT Thai food. He is the easiest kid to cook for. I can make anything I want without a second thought as to if he'll eat it or not. Coleman is always putting others needs ahead of his own and this quality makes him a great friend. Coleman is never afraid to be himself. He is who he is, he likes what he likes. And he doesn't try and change himself for anyone. I love this about him! Coleman is a kind, sweet and an amazing boy! I'm so blessed to be his mom and there's not a day that goes by that I don't remind myself of that. Happy birthday to my sweet boy! I love you, Coleman! Fun at Heber Valley Camp! Friends in Need...are friends indeed!